How can I set it up? Simple pull up a vendor in the vendor maintenance window (Cards-Purchasing-Vendor,) and click on the Accounts button in the bottom right-hand corner. This is the window where you can setup the default account numbers for this vendor. On the Purchases line, enter the account number you want to use as the default, save and close! That’s it! Now when you enter an invoice in Payables Transaction Entry the default account number will automatically populate the Purchases line. What if this vendor does not have a default account, is there anything I can do to make it easier still? Of course, you can! 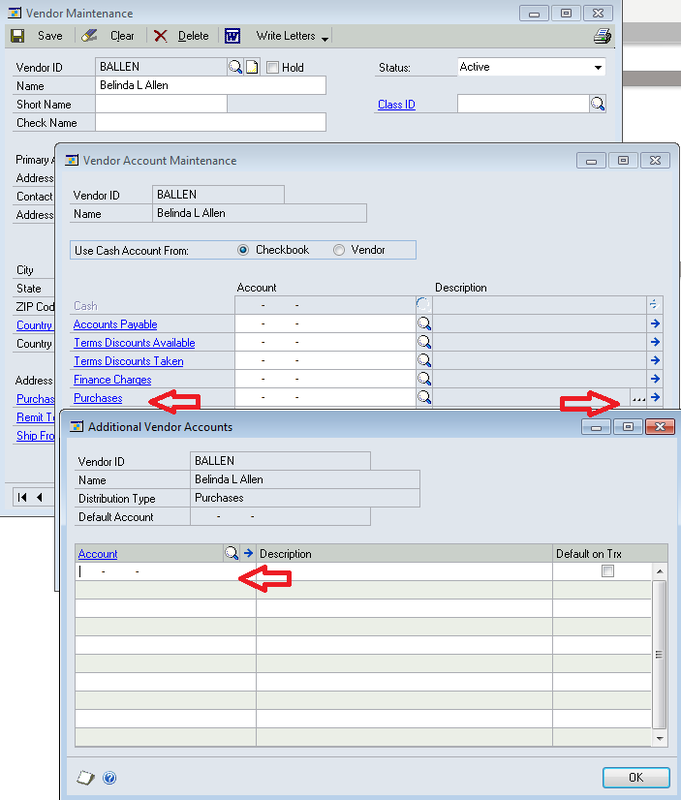 In the Vendor Account Maintenance window click on the ellipses button on the Purchases line to open the Additional Vendor Accounts window. The ellipses button is the little button on the right with 3 dots in it. Enter all the accounts this vendor can use, save and close. Now when you are entering distributions for a Payables Invoice, the account lookup window will only show these accounts first, making it MUCH easier to find the right account. You still can look up and/or use any active account number in the GL, but finding the correct account among 10 accounts is easier than finding the correct account among 500+ accounts! Previous Previous post: Made a mistake in Microsoft Dynamics GP?